This is a question for the experts. To my knowledge, at least in recent in recent years, neither Brian nor Roger has never said anything about each other's solo work. Is there any trace of any such comment being made since Roger released "I Wanna Testify" ? And if not, what do you think it means ? Do we have any indication that they basically dislike each other's solo music ? There's an infamous interview with Roger from 93 ish, where the interviewer brings up some comments from Brian regarding the cross, and how he felt the approach of gathering unknown players was not wise. Thanks eiricd. Interesting. I didn't know that. Any idea where I could listen to or read that interview ? On the rare ocassion that I've heard Brian talk about Roger's song he has always seemed a bit dismissive. 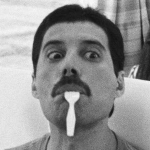 He often praises Freddie's songs to the max, and is complementary about some of John's, but even in the Making of ANATO DVD when talking about I'm In Love With My Car, he can't seem to bring himself to heap praise on Roger's writing. If he does comment he will always seem to just refer to something as 'a nice little song' or something similar. That is not quite true that Freddie's solo work was praised. Freddie used some german, unknown musicians from the streets as well.. with the result being his solo work was not sounding like it should have done. I don't think Brian was too happy that Freddie used an amateur guitarist. The exception was the Barcelona album, which had a very high quality production, professional musicians, including John Deacon on bass guitar for the track "How Can I Go On". Listen to the guitar solo from 3:23.... not even in tune. Surely Freddie could have used some better musicians. I don't recall Roger saying anything about the Brian May band either. But Brian had the best drummer in the World, mr. Cozy Powell (RIP), and the great Neil Murray. If you compare all the band member's solo collaborations, there is no doubt that Brian had the best musicians, and the best production. Roger is best when he is 100% solo, and playing all the instruments himself. That said, I think Roger's Fun In Space and Electric Fire are the two most interesting solo projects, lyrically and musically. Brian had the best production, while Freddie wrote the most catchy songs. Add all of them together, + John Deacon and you have Queen. I still get a buzz listening to Fun In Space and Strange Frontier even now after all this time. Roger has by far had the best range of solo albums with Brian the better touring solo artist, much more polished production. Although if you could see past the lyric sheet reminders and small venues an awful lot of Roger's shows were really down and dirty with some great playing even with The Cross. I have always felt that Brian has just cobbled albums together from bits of songs he has had lying around for years, which in my opinion by the time they finally get finished sound a bit dated and predictable. I have always said i would love both Brian and Roger to spend 6 weeks writing and recording live style with each other and a few guest musicians no pressure and just release whatever they come up with 'warts an all' i think we would get a great eclectic mix of rock and acoustic tracks. Sadly i feel both would view this as a pointless exercise as the end result would reach so few people. hotspace1966 wrote: I have always said i would love both Brian and Roger to spend 6 weeks writing and recording live style with each other and a few guest musicians no pressure and just release whatever they come up with 'warts an all' i think we would get a great eclectic mix of rock and acoustic tracks. Sadly i feel both would view this as a pointless exercise as the end result would reach so few people. Yes, that's one of the reasons why they (or at least Brian) would not be up for it. I'd say there are least two other reasons. Number one is that, as you've also said, Brian is far from being a prolific songwriter. I've calculated that he's written 3 songs per year on average throughout his carreer, and has (co-)written only 19 songs in the last 20 years. Considering the fact that he only managed to come up with 3 songs for TCR, I doubt he feels condident enough in his own creativity to start working on a new album. Number two is, I suspect, that there's very little mutual appreciation of each other's songwriting talent. It's no coincidence that throughout their 50-year long partenership they have only co-written 3 (less-than-memorable) tracks, including one instrumental track for the FG soundtrack. hotspace1966 wrote: I still get a buzz listening to Fun In Space and Strange Frontier even now after all this time. Roger has by far had the best range of solo albums with Brian the better touring solo artist, much more polished production. Although if you could see past the lyric sheet reminders and small venues an awful lot of Roger's shows were really down and dirty with some great playing even with The Cross. I have always felt that Brian has just cobbled albums together from bits of songs he has had lying around for years, which in my opinion by the time they finally get finished sound a bit dated and predictable. I don't like Brians albums. Very disappointing. Just sound like bad Queen albums. I was expecting a far harder approach than we got. Absolutely love Rogers first 3 albums and yes his tours were always good fun and really well played whereas Brians seemed a bit forced,.